On April 30, Junior Kelly, one of reggae's quiet forces, will release his 10th solo album, Piece of The Pie. 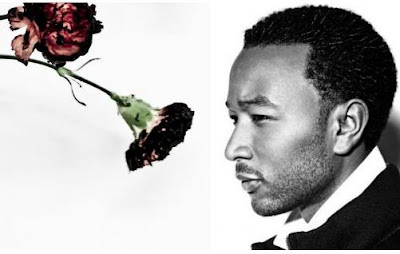 The 15-track effort, produced by Anthony Senior, brings collaborations with Lion Face, Smiley and Mark Wonder. Through his music, Kelly has always fought for social justice, economic equality and freedom for all. As such, he feels everyone deserves a Piece of The Pie. 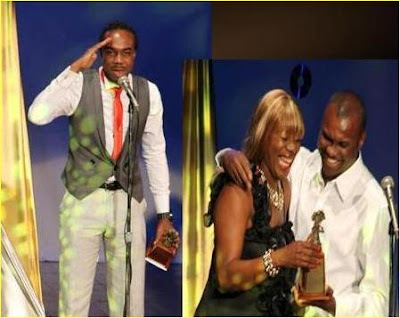 Returning to the spirit-lifting real of reggae gospel, seasoned crooner Sanchez will drop his inspirational album Giving Praises [Live] on April 23. 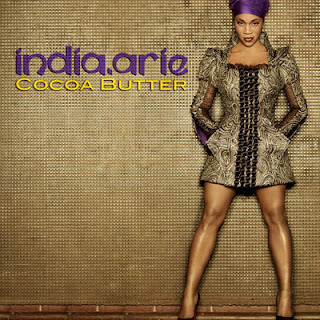 Executive produced by Jason Sterling of JASFAR Records, the entire set was recorded live and mixed at the Church of Fort Lauderdale and features everything from soulful R&B to reggae and is balanced with soothing gospel-tinged cuts. Finally! 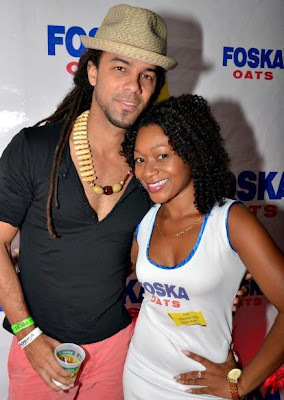 Supertalented singer, songwriter and musician Bryan Art, known for penning songs for the likes of Etana, Luciano and George Nooks, will debut his own self-titled album via Altafaan Records on April 16. The Firehouse Crew member and bandleader for Bushman's backing band steps out on this 12-track solo effort, which delivers collabos with such heavyhitters as Capleton and Queen Ifrica. 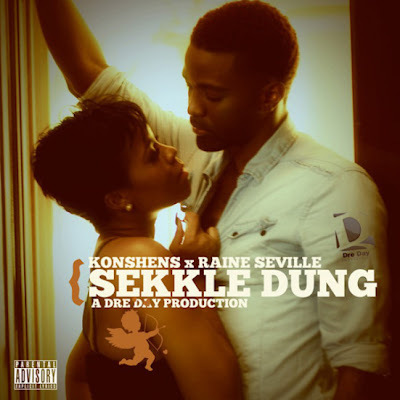 Ahead of his hotly anticipated sophomore record, Hotel Room, dancehall star Konshens will whet appetites with the May release of a live DVD highlighting his epic 2012 performance in Uganda, where he was greeted by a 25, 000-strong audience. The DVD, out from VP Records, follows his critically acclaimed solo disc, Mental Maintenance, released early last year. Hotel Room, meanwhile, is set to arrive sometime later this year. FACE VALUE: "I hope to bring realness and freshness to theatre." Starring as the heroine Oya in Tarell McCraney's In The Red and Brown Water (returning to the Pantry next weekend), Shanique Brown brings to life an extraordinarily gifted young woman caught between two handsome men pining for her affection. But, as Brown makes abundantly clear, that's the closest she's ever come to being involved in any form of scandalous love-triangle in her personal life. "That's never happened to me before. Not at all," she tells TALLAWAH, laughing. "I approach relationships cautiously. Very, very cautiously. I'm very selective of the persons that I allow close to me. 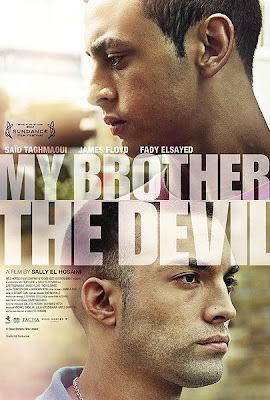 It has to do with the personalities because I always try to stay out of trouble." These days, as one of Jamaica's on-the-rise female thespians, Brown is having no trouble demonstrating that she's an actress possessed of intelligence, admirable range and emotional generosity. As the conflicted Oya, Brown simply shines. "It has been my most challenging role to date," confesses the Kingston native, who previously appeared in 2011's Hairpeace, "because she's younger than me and I'm used to playing women who are much older than myself or somewhat closer to my age." Speaking of age, the Ardenne High alum turns 21 this Saturday. But from as far back as she can remember, she knew she wanted a life on the stage. "I've always loved acting and the performing arts," she says. 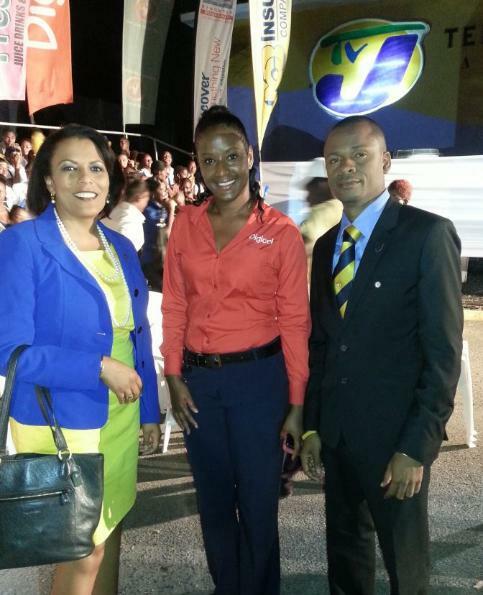 "Ardenne basically set the stage for me. 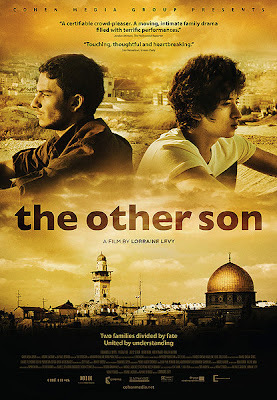 It's through Ardenne and Suzanne Beadle that I met (director) Fabian Thomas." 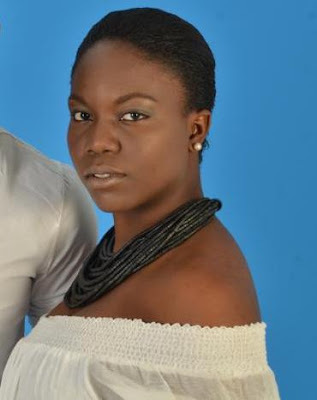 As for her daily life, Brown is currently enrolled as a second-year Literatures in English major at UWI Mona, but is eyeing a switch to Entertainment Management or a transfer to the School of Drama at the Edna Manley College. And when it comes to her future and her ambition to help change the industry, Brown is certain of what she's bringing to Jamaica's theatre landscape. "I hope to bring realness and freshess," she says, "and learn as much as I can from the people I look up to, like Nadean Rawlins." 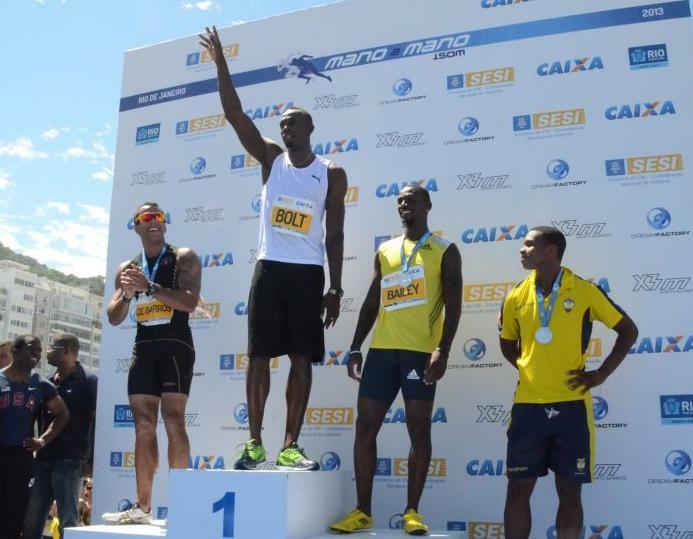 NUMBERS GAME: Bolt and Lazaroni in Rio de Janeiro, Brazil on Thursday. This Easter holiday has turned out to be quite a superbusy period for two of Jamaica's iconic track superstars, Usain Bolt and Asafa Powell, who are making their presence felt (in their trademark fun-loving styles!) with exploits overseas. First up is the World's Fastest Man who has flown to Brazil to take part in the Mano a Mano 150 M race challenge in Copacabana Beach in Rio de Janeiro. 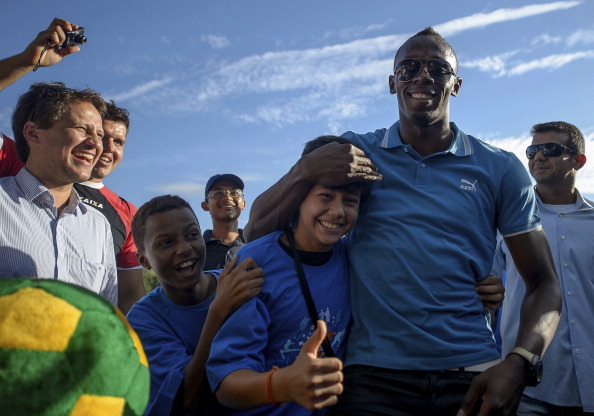 Since landing in the pristine South American country, Bolt has visited the Futuro Olimpico (or Olympic future) project alongside Antigua's Daniel Bailey, tested his soccer skills and bonded with some of the local kids and future track stars. Above, the Jamaican Olympic gold medallist Bolt smiles with a book about Maracana Stadium after a news conference to present the 'Mano a Mano' challenge at the Windsor Atlantica, sharing share lens time with Andre Lazaroni, Sports secretary of Rio de Janeiro. 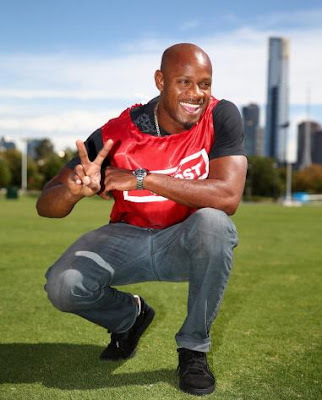 Meantime, Asafa Powell's Australian sojourn so far has included attending a Stawell Gift media call at Grandstand Oval on Wednesday in Melbourne where he raced with local children sponsored by McDonald's. 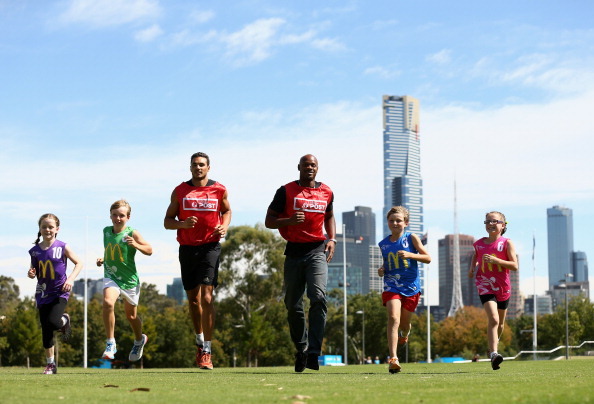 Powell, who will be running in the 2013 Qantas Melbourne World Challenge, slated for April 6, jetted into Melbourne on Tuesday morning, and later kicked off preparations for the big race, which will take place at the Lakeside Stadium in Albert Park. 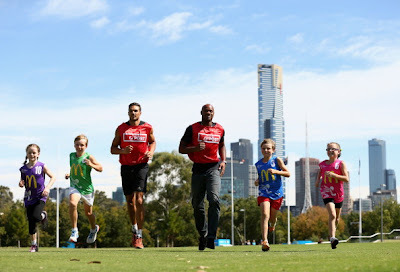 Powell, who has run 9.72sec in the 100m, also faced the local media in Melbourne on Wednesday afternoon for a running sequence of interviews. 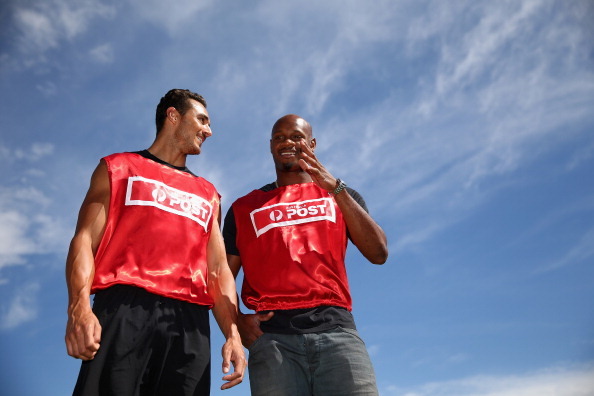 CLASS ACTS: Anderson (left) and Barrett, with Alwyn Scott. MOMMIE DEAREST: The author chronicles a deeply personal aspect of her life. Maya Angelou’s extraordinary life has been chronicled in her bestselling autobiographies like I Know Why the Caged Bird Sings. Finally, though, the legendary author is opening up about the deepest personal story of her life: her relationship with her mother. For the first time, the celebrated author and poet reveals the triumphs and struggles of being the daughter of Vivian Baxter, an indomitable spirit but a presence absent during much of Angelou's early life. As it happens, Baxter sent three-year-old Maya and her older brother away from their California home to live with their grandma in Arkansas when her marriage began to crumble. The ensuing feelings of abandonment stayed with Maya for years but their reunion, a decade later, began a story that she's now ready to share. In Mom & Me & Mom (out April 2 from Random House), Angelou dramatizes her reconciliation with Baxter (whom she prefers to simply call “Lady”), revealing the profound moments that shifted the balance of love and respect between them. "It's the latest, and most potent, of her serial autobiographies...[a] tough-minded, tender-hearted addition to Angelou’s spectacular canon," notes Elle Magazine, while Essence calls it “mesmerizing...Angelou has a way with words that can still dazzle us." Per Publisher's Weekly, "the lessons and the love presented here will speak to those trying to make their way in the world." BRAWTA: The cover image of Christopher John Farley's buzzworthy fantasy-adventure novel, Game World, arriving in February 2014 via Akashic Books. "I was thinking it would be great to write a sort of fantasy novel for kids that draws on the myths and legends of the Caribbean," saya Farley, "things like duppies and rolling calfs and all the kinds of creatures that are in our mythology that we grew up with and that our grandparents told us stories about. So this is a book about that. Look out for it. It's gonna be terrific." 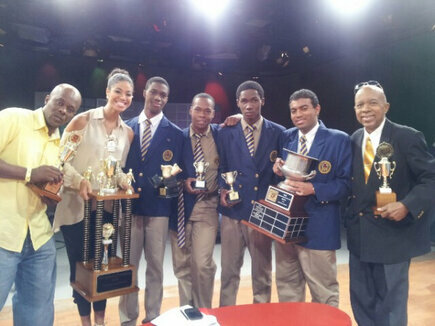 NEWS & NOTES: Jamaica's Whycliffe Cameron is new WICB president + Ardenne High are 2013 SCQ champions! BEST OF THE BEST: The brilliant all-male team of Ardenne High were crowned 2013 champions as the curtains came down on the 44th season of TV J's Schools' Challenge Quiz on Wednesday. 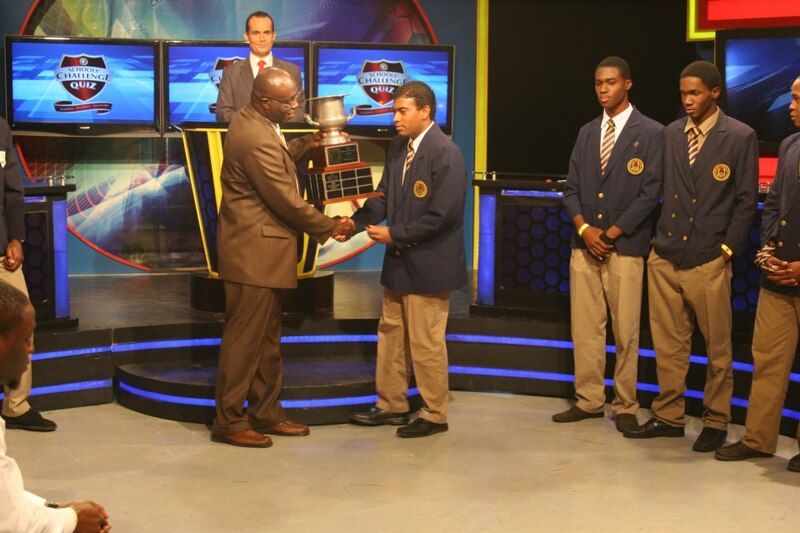 The St. Andrew-based Ardenne fended off a spirited challenge from Portland's Titchfield High, who were making their third consecutive appearance in the SCQ grand finals. Ardenne won 39-33 to claim the championship trophy and a stash of other attractive prizes. Kingston College defeated perennial rivals Calabar High (this year's winners of Boys' Champs) in the third-place playoff. Some 64 schools took part in this year's competition. 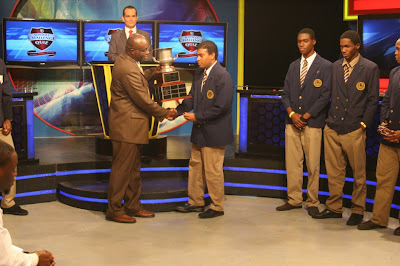 Above, Gary Allen of the RJR Group presents the championship trophy to Keenan Falconer, captain of the winning team. HIGHER OFFICE: Following elections held in Barbados on Tuesday, Jamaica's Whycliffe ‘Dave’ Cameron (left) is the new President of the West Indies Cricket Board (WICB). Cameron's running mate, Emmanuel Nanthan of Dominica, is the new vice-president. 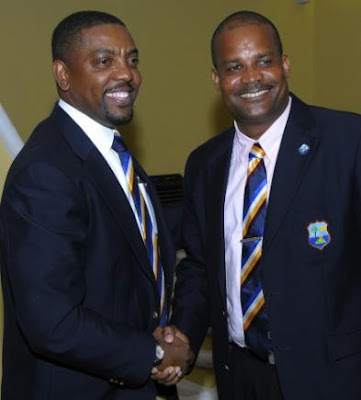 "As we take over the reins of the WICB," said Cameron, 42, "we assume responsibility with very lofty goals in our minds and the understanding of the reason we are here and what everybody in the region is looking forward to us being able to accomplish." In a congratulatory message, PM Portia Simpson-Miller said Jamaica and the region expects that under Cameron's watch regional cricket will chart a new course of development and success. "With our long history of excellence, you now have the opportunity to build on this legacy for the greater good of the sport and cricket-loving fans around the world," Simpson-Miller said. "I have every confidence that the process and development of West Indies cricket will benefit from your talent, passion and considerable experience." You can't get Cathi Levy's brand of ageless beauty, but you can come dangerously close. Just follow her tried-and-proven formula for staying eternally fit, fabulous, and young at heart. "Manage your stress," she tells TALLAWAH, flipping back her long and lustrous mane to let out a hearty laugh. "I hand it all to the Father, and I keep on trusting that he will see me through." These days, stress management is certainly coming in handy for the legendary theatre maven and Miss Jamaica World 1983, as she gets set to debut her latest labour-of-love project, Imagine, a never-before-seen theatrical marvel that promises to dazzle and delight patrons when it opens in Kingston next month. Given her mile-a-minute stamina and huge workload (not to mention the decades she's already poured into Jamaica's performing-arts scene), we had to ask: How does she do it? TALLAWAH: Cathi, you continue to re-define what it means to put on show while pushing the limits and inspiring Jamaicans, young and old, along the way. What keeps you going? Levy: My love for the theatre. My love for working with young people. And there's so much that falls under the umbrella of theatre. It's about making an audience happy. Transporting them for the few hours that you're fortunate to have them. And making a difference in people's lives. When people see the production, their lives must be touched. That keeps me going. Also the support of team members, family and friends who always have your back. You've been a national beauty queen, performing-arts entrepreneur, activist, icon and inspiration. How do you feel about your life at this point? I'm incredibly humbled. And I'm especially proud of the accomplishments of the young people who have gone through Teen Players Club and the Cathi Levy Players. They continue to shine, and not only in the performing arts but in all aspects of life. And they make me proud, so that's definitely a huge accomplishment for me. At this stage, though, I enjoy sitting back and watching them do the work. (Laughs). So you're ready to take on a more behind-the-scenes kind of role, so to speak. This past Monday, you were presented with a special lifetime achievement award by the International Theatre Institute (Jamaica Chapter). Were you thrilled, anxious, nervous about the huge moment? I was very humbled by that, and very deeply appreciative. 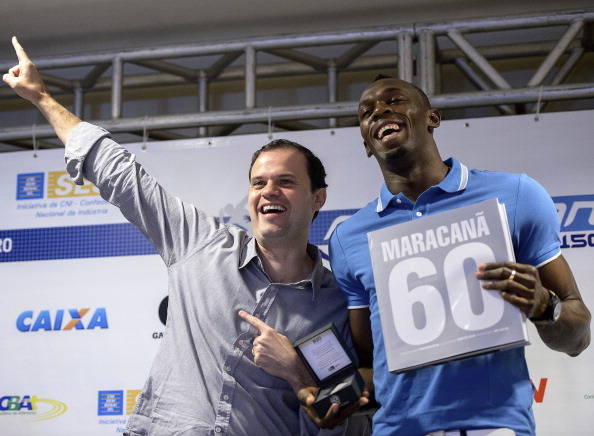 As I said [at the awards], when you do what you love doing, to be rewarded for that is just icing on the cake. It's very special. What are your guilty pleasures? How does Cathi Levy unwind? I love growing things. I have a little farm right outside my house, and I grow vegetables and herbs, and that makes me happy. I also love rescuing animals.